Detroit-based General Motors Co.’s Chevrolet is expanding its Colorado range with two special editions: the off-road Z71 Trail Runner and the street-focused RST. The Colorado was introduced as a 2015 model. 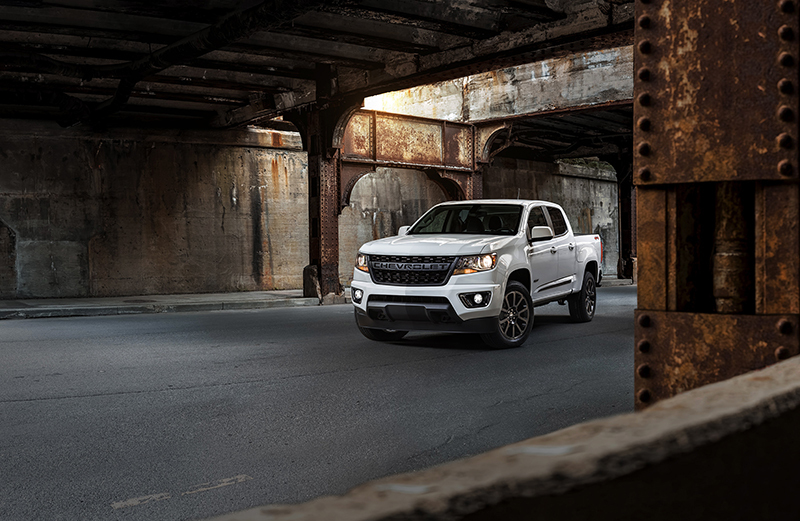 Both special editions feature the flow-through Chevrolet lettered grille first introduced on the Colorado ZR2 Bison. The grille also is available as an accessory for a manufacturer’s suggested retail price of $395, not including installation or tax. The Colorado RST builds on the street-focused models offered on Tahoe, Suburban, and Silverado. For Colorado, RST is based on the LT trim and adds monochromatic exterior offset with black beltline and body side moldings. It also has a black tailgate bowtie, Colorado, and RST badges. It is the first Colorado to offer 20-inch wheels, finished in low-gloss black. With the new Trail Runner, the Colorado lineup offers four levels of off-road capability. The Colorado Z71 has off-road suspension, automatic locking rear differential, and 17-inch painted wheels with all-terrain tires. The Colorado Z71 Trail Runner begins with the Colorado Z71 off-road package and adds the Colorado ZR2’s underbody protection, a stamped aluminum front and mid skid plates, functional rocker protection, and Goodyear Duratrac tires. The Colorado ZR2 features a factory-installed 3.5-inch wider track and a suspension lifted by 2 inches. Class-executive features include front and rear electronic locking differentials and Multimatic DSSV Dampers. It also has front and mid skid plates, rocker protection, and front and rear bumpers modified for better off-road clearance. The Colorado ZR2 Bison adds five hot-stamped Boron steel skid plates and stamped steel front and rear bumpers with front winch provisions and rear recovery points. In addition, Chevrolet introduced 15 factory race components for the Colorado ZR2. Developed by Chevrolet Performance in collaboration with Multimatic and Hall Racing, the components were validated over 10,000 miles of off-road racing. Chad Hall, an off-road racer, and the Chevrolet team completed the Best in the Desert race series and used the Colorado ZR2 to pre-run the Baja 1000 race. Components include a set of Multimatic Dynamic Suspensions Spool Valve (DSSV) dampers, Multimatic Front Long Travel DSSV Shocks, front and rear jounce shocks, and reinforced components including steel drive shafts, half shafts, and tie rods. The parts can be purchased individually or as a complete package and go on sale between now and early 2019.